It’s a standard question for students who haven’t yet entered the year-round workforce: How did you spend your summer vacation? For those on the receiving end, it’s often a question to be avoided. But for a handful of ambitious political science and public policy students from the University of California, Riverside, answering it this fall should be a breeze. 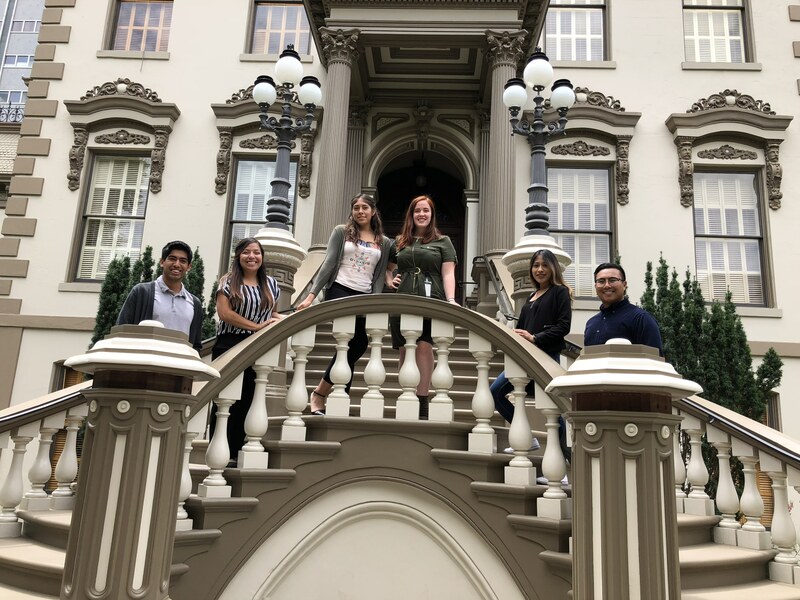 As participants in the fourth year of the Loveridge Summer Fellowships in Sacramento program, 11 rising seniors and recent graduates spent the summer working as full-time interns in the state capital. Their placements included 10 major offices with ties to government and politics, providing an in-depth look at how the country’s most populous state functions on a day-to-day basis. Ron Loveridge, a longtime UC Riverside professor of political science, director of the university’s Center for Sustainable Suburban Development, and the program’s namesake, said the fellowships were designed to emphasize California’s importance as a national leader. Loveridge, who served as Riverside’s mayor for two decades, is credited with helping place students in internship positions in Sacramento, Riverside, and Washington, D.C., for more than 50 years. 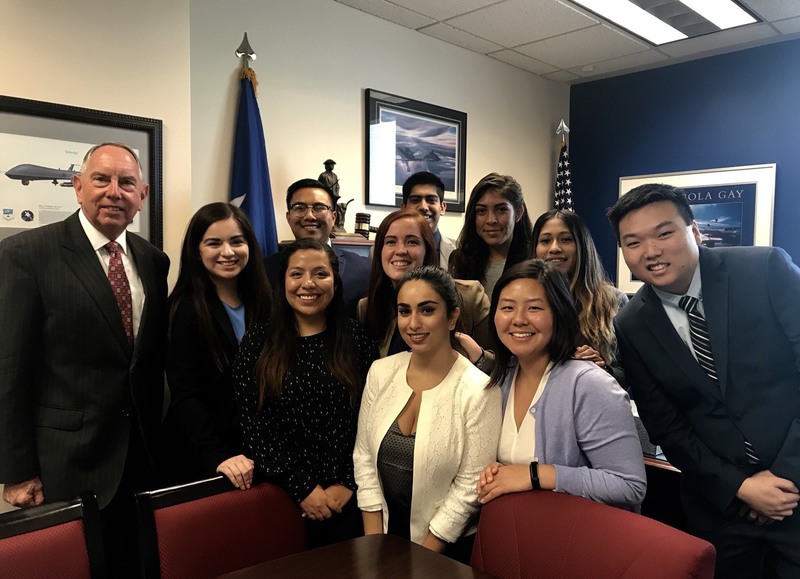 This year's Loveridge Summer Fellows meet with Sen. Richard Roth of Riverside. Yet despite California’s significance, he added, few courses offered within the University of California system focus specifically on state government. 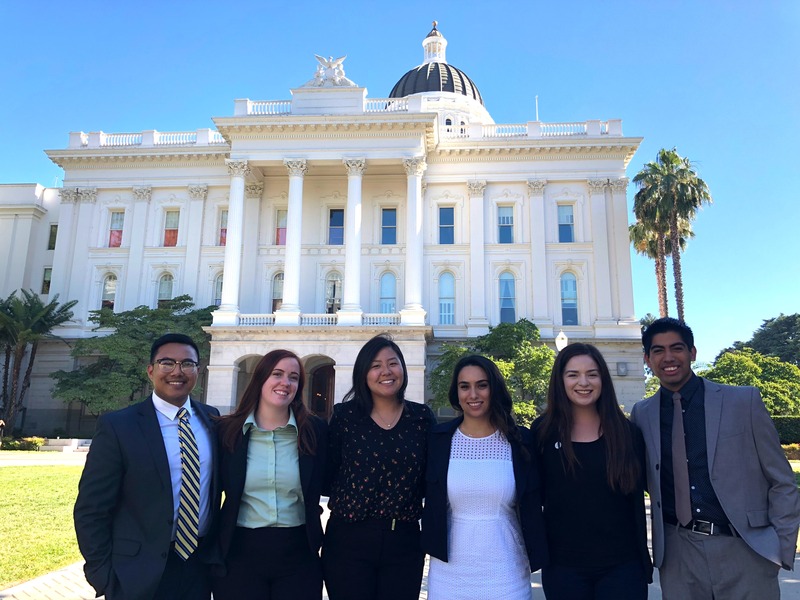 In addition to internship placements, the fellowship program seeks to address the need for more education on the inner workings of the capital city by connecting students with alumni and other mentors throughout their stay in Sacramento. This year, each participating fellow received a $3,000 stipend to cover living expenses, and all met weekly for lunch seminars hosted and led by Lizette Navarette, a 2004 UC Riverside graduate who now serves as vice president of the Community College League of California. 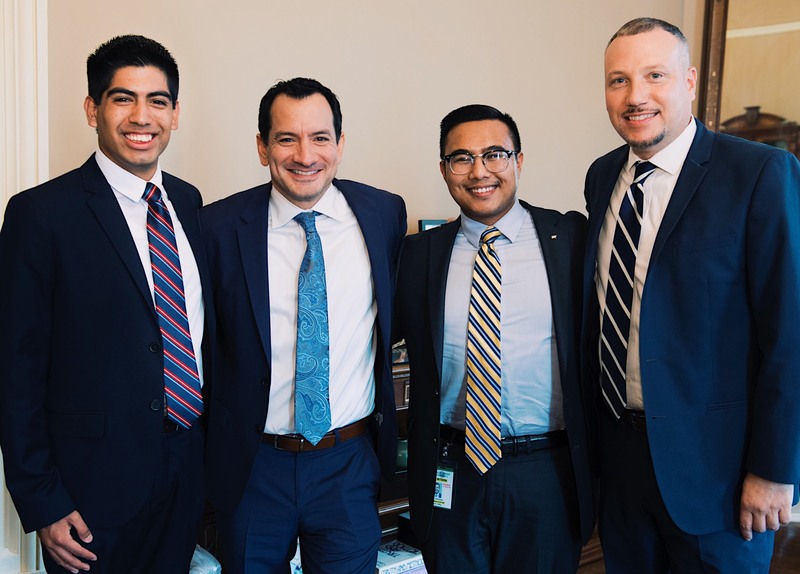 Past fellowship recipients — there have been 32 over the past four years — time and again described their experiences in Sacramento as “life-changing.” For some, such as political science major Mark Sebarrotin, one of two summer 2018 interns in the office of Assembly Speaker Anthony Rendon, the program opened doors that otherwise might have remained shut. Fellows Mark Sebarrotin, Brooke Norton, Juliana Park, Meena Kaypour, Eileen Tovar, and Daniel Castaneda tour the capital city. What was a professional high point of your time in Sacramento? The best experience was the end of session, when all the legislation is voted on. It usually goes late into the night to ensure every piece of legislation is seen to. My favorite part of the fellowship was being on the Senate floor with the legislative aide and director — I got to see the legislature in action, as well as make sure our member was OK on the floor and had all the materials he needed. What was one of your favorite tasks or projects you worked on during your internship? I got to volunteer at the California State Fair in our general information booth, where I spoke to people about parks in their local areas. This internship made me realize I want to pursue a career in community outreach locally — I enjoy the interaction with constituents and seeing firsthand the impact of my work. Is there one memory that sticks out from your time in the capital? The day before Professor Loveridge came to Sacramento to have lunch with the fellows, he stopped by the Capitol without telling us. I was with another fellow, Mark, walking out of the building, and I did a double-take once I realized it was Professor Loveridge. Before we could even say hello, he was stopped and recognized by at least four former students, colleagues, and friends. He was like a celebrity! What was a professional high point of your time in Sacramento? I would set up coffee meetings with staff around the office to see what I could learn from them. Most of the staff I had the chance to talk to were legislative representatives. Hearing them talk about what it’s like to be a lobbyist for CSAC inspired me to think about lobbying in the public sector before I run for local office. Fellows spent 10 weeks in the capital working in a variety of offices tied to state government and politics. What was one of your favorite tasks or projects you worked on during your internship? I gathered property tax data among the nine Bay Area counties and their incorporated cities, looking for growth trends that could help solve the current housing crisis. Working on the project gave me an incredible amount of insight into how complex certain issues can be, but also into how collaborations between cities, counties, and the state can help solve them. Is there one memory that sticks out from your time in the capital? The most exciting was the night Assemblymember Medina and I were driven to local favorite Vic’s Ice Cream by Speaker of the House Anthony Rendon and his wife, Annie, in his personal car. We bonded over the fact that Speaker Rendon, Assemblymember Medina, and I were all UCR alums who somehow ended up together that night, in the capital, doing something to represent Highlanders well. What was a professional high point of your time in Sacramento? A major part of my internship involved doing research for several projects related to the Voter’s Choice Act and identifying community events we could attend to register people to vote and inform them about the act. I came to value the importance of voter education because many groups are unable to access accurate information. Fellows Daniel Castaneda and Mark Sebarrotin interned in the office of Assembly Speaker Anthony Rendon of Lakewood. What was one of your favorite tasks or projects you worked on during your internship? Doing research on drones and local versus federal regulations concerning them. What made it my favorite project was learning about the issues that arise from drone regulation — it reasserted the fact that local regulation is crucial, and that politics is more complex than you first imagine. Is there one memory that sticks out from your time in the capital? I spent the last day of my fellowship lobbying alongside some of the best environmental organizations in the state of California for Green California’s Advocacy Day. Together, we advocated for environmental legislation that would protect California’s public health, land, water, and air. What was a professional high point of your time in Sacramento? The highlight was participating in the South East Los Angeles Arts Festival hosted by Speaker Rendon in South Gate. The event took place in the concrete bed of the river and brought together community members, artists, vendors, and local leaders interested in river revitalization.